Roast Duck Curry can change your life; it happened to our neighbors. Pierre and his family moved from France to next door and I made roast duck curry for them. That was just a start: we became good friends and Pierre fell in love with Thai food. A couple years later, after moving back to France, they moved to Thailand where they still live and love the food. 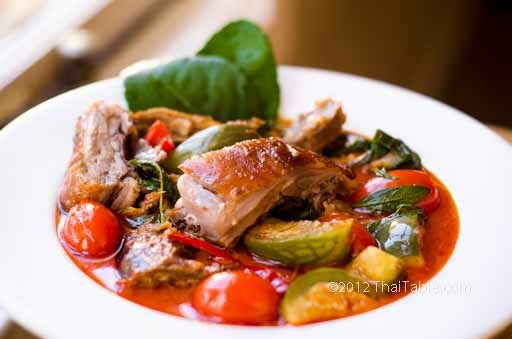 In the pantheon of Thai dishes, Roast Duck Curry fits a place high above the curries you normally get at restaurants. You definitely won't see a pot of duck curry sitting on a street food vendor's cart. The price of a roast duck is 3 times that of the chicken. The duck makes for a rich flavor and the dish looks fancy. That being said, I often use this dish to recycle left over roast duck. Use the recipe as a guide, you may want to add more duck, coconut milk and/or curry paste, as you like. Use any large red pepper that you can find. The pepper should add color not heat. 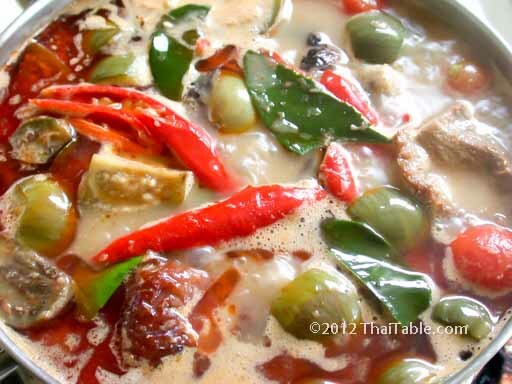 In Thailand, we use prig chee fah which is mild. This curry is a great way to recycle leftover roast duck. Add bones and neck to the curry to add flavor. Hold the fish sauce until you have tasted the curry sauce. The duck has already been seasoned. Your curry paste may also have enough salt. Not wanting to waste such a good curry, I often add more eggplants toward the end when there is just curry sauce left. Cut the Thai eggplant's stem off. Halve the eggplant from stem to the other end. Quarter the small ones and 6th the larger ones. Cut the stem and remove the seeds of the red pepper (picture2). Slice red pepper into long thin pieces, about 2 inches. 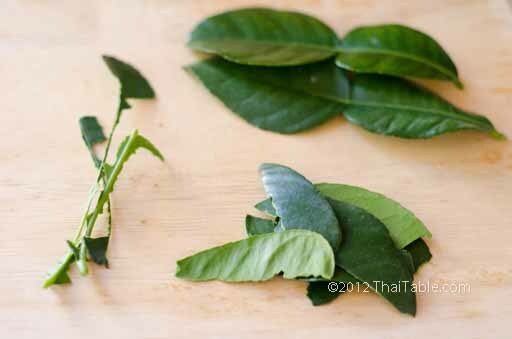 Tear the kaffir lime leaves away from the stem (picture 3). Toss out the stems. Add half a cup of coconut milk into a 2 quart pot. 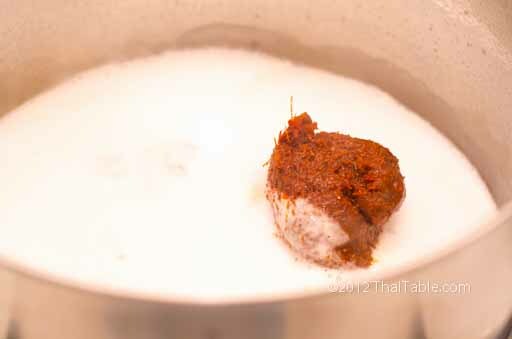 Over medium low heat, add a tablespoon or two of red curry paste (picture 4). Stir to break the paste and mix with coconut milk. 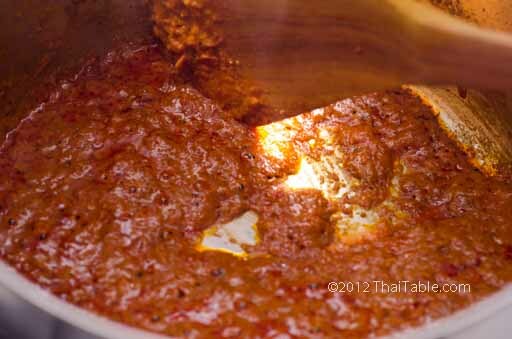 Let the mixture simmer and turn into oil, about 5 minutes (picture 5). Add another half a cup of coconut milk. Stir and mix it well. Let it simmer again. You should see a few spots with red oil bubbling up. If you like your curry with lots of pretty red oil, let the oil bubble up more. 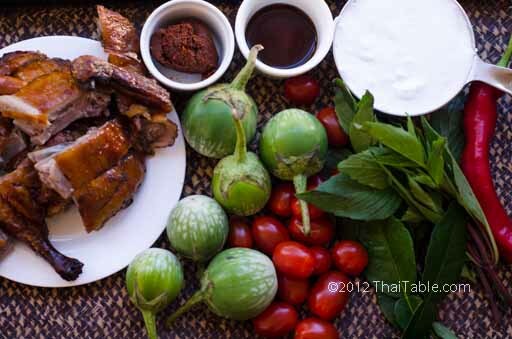 If you'd prefer less oil floating, add the duck, tomatoes and Thai eggplants. Otherwise, wait until more oil bubbles up before adding duck, tomatoes and Thai eggplants. Add the rest of the coconut milk. Take a cup of water and rinse out the coconut milk container/can. Pour it into the pot. Let it come to a boil. Taste before adding fish sauce. The duck has already been seasoned and the curry paste has some salt. The curry may have the right balance of the flavor. If it seems bland, add a teaspoon of fish sauce at a time. 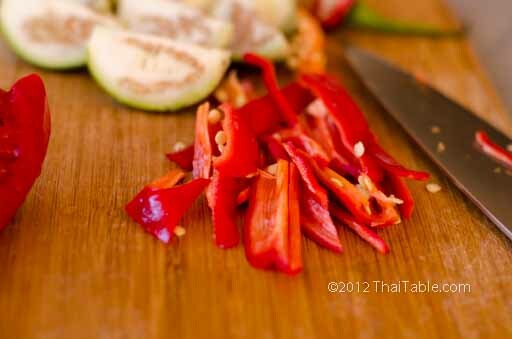 When you're happy with the seasonings, add red pepper, kaffir lime leaves and Thai basil.